The newest product from Magneti Marelli for your FIAT 500T. This unit is designed to work with the North American FIAT 500T. The new Magneti Marelli Power Pedal. This module is designed to remap the way your Thottle Pedal sends a signal to the ECU of your FIAT 500T. It is a plug and play device that can be easily installed in less then 5 minutes at home. The devise has been designed to make your 500T more responsive. We have been testing this device on our own cars and can inform you that it makes a significant difference in the way the 500T responds. 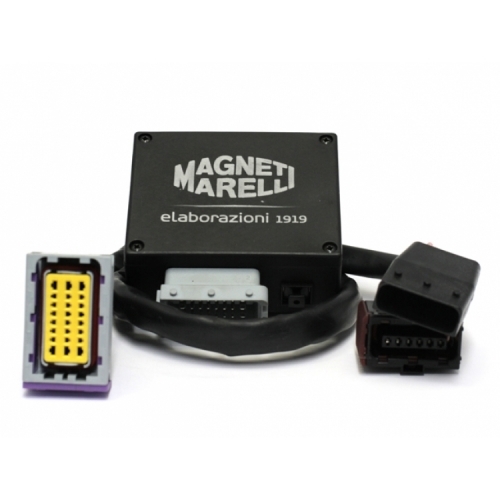 We have installed it and use our own car and as good as the Magneti Marelli Engine Controller is adding this unit to the car in addition to the controller made it even better! If you are looking to increase the response of your FIAT 500T put this item at the top of your list!!! This listing is for the Power Pedal without the optional remote. If you have already purchased the Magneti Marelli Engine Controller (for the 500) or are planning to purchase it this unit (Power Pedal) is fully compatible. If your MM Controller has the optional remote we can tune this Power Pedal to be controlled by the same remote at the same time! Give us a call at 562-981-6800 and we will program the Power Pedal to work in synch with your MM Controller. You will be able to control the settings on both unit at a touch of a button.